American President Lines (APL) and the Port of Los Angeles recently announced agreement to jointly develop a multimilliondollar container terminal at Los Angeles, which, when completed, will be the largest on the U.S. West Coast. The 20-year revenuesharing agreement was signed by Dorman L.
Commons, chairman of APL and president of its San Francisco-based parent, Natomas Company, and Tom Bradley, Mayor of Los Angeles, onboard the APL containership president Van Buren. Development of the parcel, located on John S. Gibson Boulevard on the West Basin of the Los Angeles Harbor, will take place in several phases to keep pace with expansion of the company's cargo volume. Initially, the development will encompass 100 acres. Upon completion of the project, the facility will have capability of on-site storage and handling of some 6,000 forty-foot containers on chassis. The terminal will ultimately include at least two deepsea berths, each 960 feet in length; a 2 0 0 , 0 0 0 - s q u a r e - f o o t container freight station (for handling less-than-full containerloads of cargo) ; and complete facilities for U.S. Customs inspection and for maintenance and repair, etc. 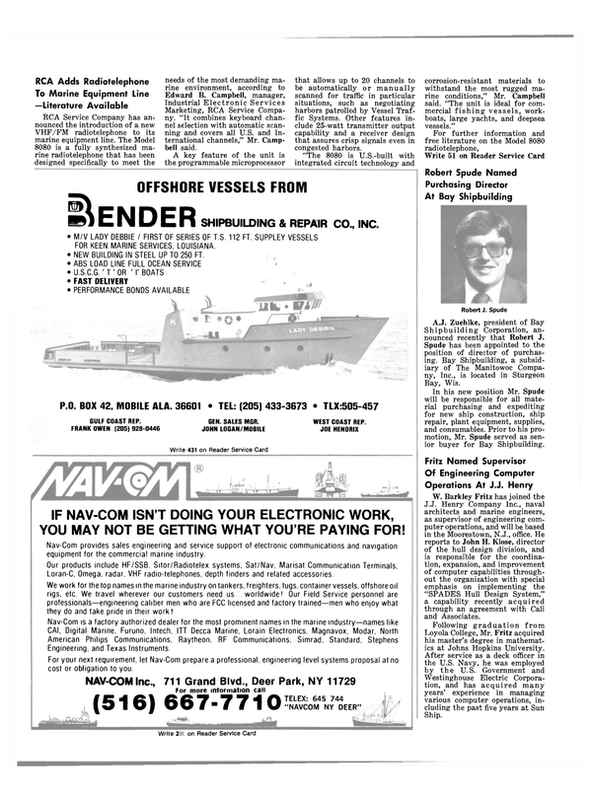 APL anticipates moving to the new facilities from its present facility in the port in 1983. In addition to meeting future cargohandling needs, the new terminal is being designed to accommodate APL's three new containerships, which when completed in 1982 will be the largest ever built in the United States and the first domestically owned and built containerships to be dieselpowered.